My baby boy turns TWO this year and my goal is to find the perfect wooden train set. Having not done any research in this area before, I found it quite overwhelming as to all the options, big and small, add-ons, etc. Here I share some of the wooden train sets I have found that are available out there. Almost everyone I have asked rates Brio to be the best in this category of wooden train sets. Brio has a fairly large range of different wooden trains and what I like about them is there are some unique options like the Mountain Passage, the Rail and Cargo set, Gold Mountain train, etc. These train sets are more pricey but everyone says they are the Rolls Royce of train sets and worth every cent! They can be found at many small boutique toy shops like the new toy shop, Owl’s Toy Barn in Lakeside. A brand that I have come to know and love since we’ve had children is the Melissa and Doug range of brilliant quality toys. I was pleasantly surprised that they also have a lovely selection of wooden trains and vehicles, including the standard figure 8 train set. The one that really stands out for me is the large 130 piece set. It is available at Toy Time in Constantia Village Courtyard and retails around R1800. Another brand that I discovered in my wanderings is BigJigs and this brand is available at Play Toys in Constantia Village. 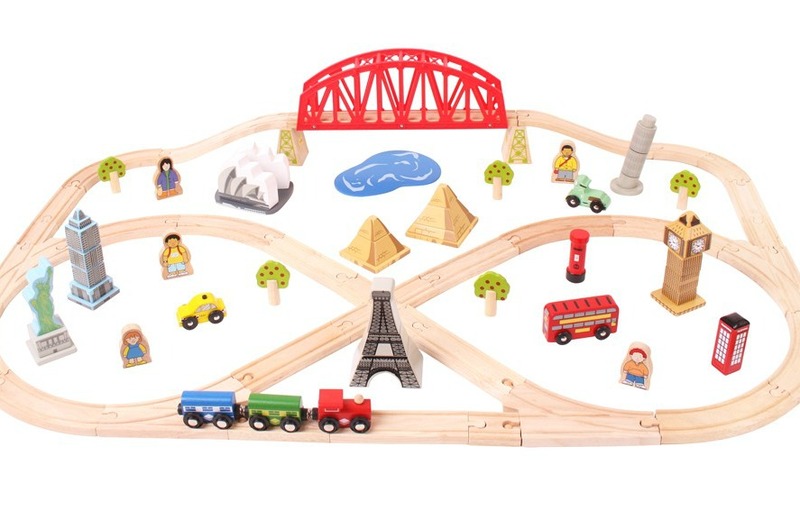 There are some fantastic options in this range, also figure 8 and the larger sets, but the one that I really like in their range is the Rail Around the World train set that has little wooden landmarks from around the world like the Eiffel Tower, Pyramids, Statue of Liberty. This one retails at around R1200. I also popped into to Nucleus Toys in South Palms, Retreat who have a great range of educational wooden toys and train sets. What is nice with all the train sets I found, is that they all are compatible with each other and the extensions all fit together if you mix and match between brands.